Income and wealth are related, but it's a complicated relationship. The conclusion at DQYDJ? 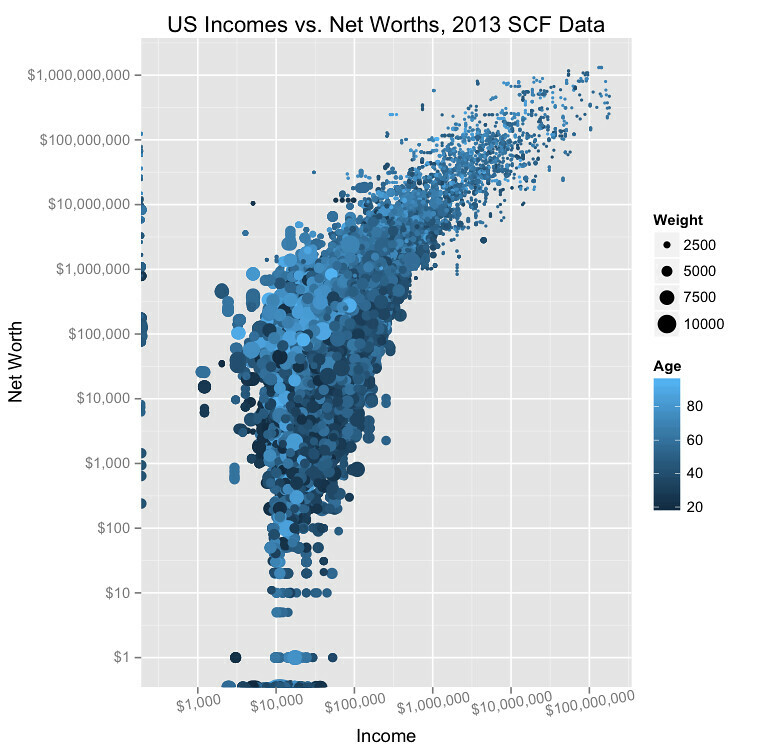 “Yes, people with higher incomes do tend to have higher net worths.” However, “the connection is a lot looser than it may appear before looking into the statistics”. For any given income level, people have a huge range of net worths. If you look at the $100,000 income level in the chart, for instance, folks have net worths ranging from $1000 to $10,000,000. That said, people with higher incomes do tend to have greater wealth. 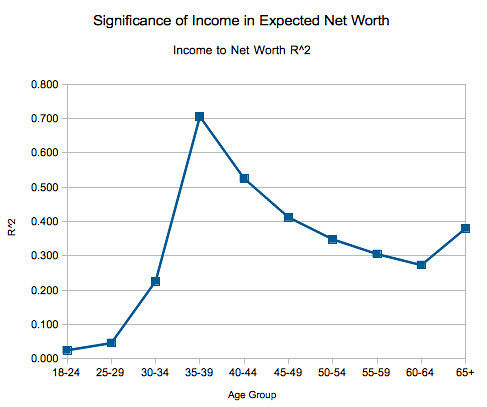 As you can see — and as you might expect — for young adults, income has very little to do with net worth. During prime earning years, however, there's a strong correlation. Then the correlation drops. Then, once you get past fifty, the correlation isn't strong at all. Earning money is only part of the equation. What you do with the money you earn has a profound impact on your wealth. If you earn a lot but you also spend a lot — especially on things that lose value — then you won't accumulate wealth. If you make poor investments, you won't accumulate wealth. If you suffer misfortune, you won't accumulate wealth. Your income is like water flowing through a hose. The higher your income, the larger the flow of water. But wealth — net worth — is like a bucket that you're filling with water. If you have a high-flow hose, but you're spilling the water on the ground instead of filling the bucket, you're not going to fill it very quickly. 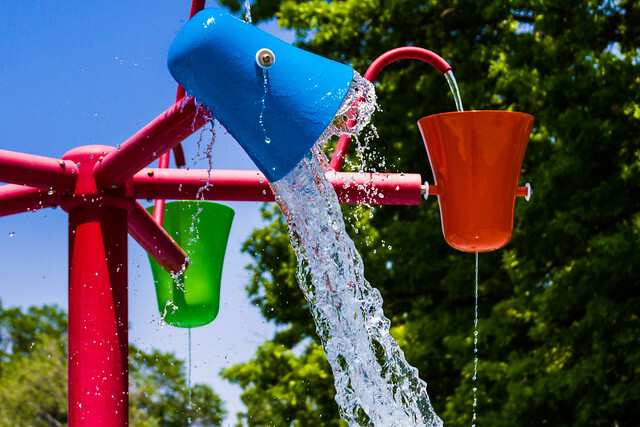 On the other hand, even a trickle of water can fill the bucket if you're careful and take your time. In my Real Life, I know families with household incomes approaching $250,000 that have almost zero net worth. They buy (and sometimes wreck) fancy cars, cars that quickly depreciate in value. They take expensive vacations. They eat out for every meal. They spend a ton on entertainment. These folks have high incomes and live a lavish lifestyle but they're not rich. If they were to lose their jobs, they'd be in trouble. On the other hand, I've met with many Get Rich Slowly readers who have mundane jobs with modest incomes, yet they've managed to build small fortunes (especially in relation to their spending). How? By keeping expenses low. They may not make as much, but they have high a saving rate and they know how to invest wisely. Yesterday at A Wealth of Common Sense, Ben Carlson wrote about the three levels of wealth. He looked at both income and net worth numbers, and at how these relate to economic class. His conclusion? 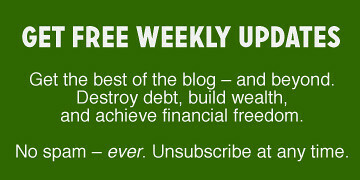 There are 18 reader responses to "What it means to be rich: The difference between income and wealth". Could wish that first graph didn’t have such high escalations between markers but I quibble.. Yet, since there are very few 80 year-olds still in the workforce at that age, would most of those light blue circles i see with income substantially higher than could be accounted for by Social Security (or even Social Security plus a somewhat larger pension) represent funds not held or otherwise reinvested, but that are derived from capital gains from sales of investments (stock, bonds, real estate etc. ), RMDs, and additional drawings from retirement accounts (to include drawing from Roth IRAs)? On the other hand, I don’t know that it is kosher to compare income to wealth when the point is reached at which the income is achieved only by reducing the wealth (and even if it is only reduced after adjusting for inflation). Maybe the income represents Social Security, pensions, passive income, and investment income (which presents problems with how you detail earnings in retirement funds)? But is that investment income counted before or after taxes, and which taxes? Conflating income and wealth is also a very big pet peeve of mine. Just about every article on the web that discusses income inequality makes that very elementary mistake and it drives me crazy. I’ve even come across it on some well-regarded FI blog posts by people who should know better. i.e. not all older people have high net worth, but people with high net worth are more likely to be older. This is excluding the outliers of those who received large inheritances or got lucky early in life, i.e. Mark Zuckerberg, Elon Muk, etc. Especially as it regards to tax policy. If you cant understand the difference between wealth and income you shouldnt comment on tax policy. I don’t mean that as a comment on what tax policy should be, but if you want to tax the Buffetts and Zuckerburgs of the world at a higher rate then INCOME tax rates won’t touch them. No matter what your opinion is, understand enough that it’s an informed one. Being the beancounter that I am, this topic is like having a great top line (revenue), an equal expense line, resulting in a fragile balance sheet position. I see it all the time. It is actually an easy topic to understand so I think in some cases people writing about it are attempting a political spin. I see this with friends, family and co-workers. I sometimes chuckle as someone complains about their salary at work while at the same time they eat out every day for lunch! Growing your own top line (salary or your business income), living within your means by managing expenses and building up a great saving (not “savings”) rate is what gets you to F.I. I do not know why people want to make these discussions so difficult. Handling money is not r0cket science. If you keep more than you make, that is the best way to having wealth, plane and simple!!! I would assume the author of the Vox piece means that the cashflow from capital gains has increased faster than wages. Thus the share of income of the überwealthy increase. Does this not make sense? Let me suggest that wealth is having money to SPEND. There are plenty of farmers with a high net worth in farmland that are struggling to pay their bills or even put food on the table. The same can be said about some real estate investors. They own a lot of highly leveraged property with a large net worth but servicing that debt leaves them constantly short of cash for living expenses and to pay their bills. The problem is not simply that wealth and income are not the same thing, but that it isn’t really clear what they mean. I think what most people mean by wealthy is usually financially comfortable with a lot of money to spend. That includes both people who have a lot of ready cash stuffed away and people who earn a lot of money. It does not mean people who bought a house 35 years ago for $100,000 that is now worth five times that much, even if their net worth is higher than the guy who is earning $500,000. Income is usually used to describe the amount you received in a single year that was subject to income taxes. By that measure, money going into our 401(K) is not income and money coming out is. If you count your 401(k) as part of your net worth, then its not really surprising that the correlation between income and net worth goes up when people retire. Its also not surprising that the correlation between net worth declines as people move through their prime earning years when every dollar they put away for retirement increases their net worth and decreases their income. This kind of analysis is the reason lies, damn lies and statistics was invented. You have a conclusion, you can find statistical evidence for it. But I don’t think anything here demonstrates how wealth and income intersect. When 20% of American households have a negative net worth, there is something screwy about a graph that begins at 0. Apparently no one has any credit card debt or is under water on their mortgage. I think we ought to be skeptical of what a more accurate graph would show. On a similar note in terms of “wealth is money to spend” I wonder if money socked away in various retirement accounts and therefore unavailable until certain time and terms (say, when you’re still some good 20 years away) can be considered wealth. It’s not quite “money to spend”, a.k.a. at your disposal? It might be a whole lot, but at the moment, one is still “not even remotely wealthy”? Wealth is having money, period. To spend or not to spend is irrelevant to wealth. Wealth is what would pass on to your heirs if you died. Whether you keep your wealth liquid or illiquid is a choice, and one that can be changed if you desire. The Farmer could sell the farm, and the real estate investor could divest. How you chose to manage your wealth for cash flow purposes can have a significant impact on your lifestyle, etc, but it is wealth regardless. If I may quibble, I don’t think the original article’s author actually conflates wealth and income. Rather, what they are doing is looking at the relation between the two, namely how in 36 years, income percentage growth has been positively correlated to wealth. The relation that they suggest (their argument) seems to be that income growth is correlated to wealth, not the other way around, because of various social factors and policies. So I suspect that they would substantially agree with your article. You seem to disagree on the specific application, but do you agree on thr general point that thrre seems to be a misunderstanding between wealth and income? Personally I think you’re giving the author too much credit. But even if yiure correct, it’s a fairly common misunderstanding. Really the definition of “rich” for most people seems to be “people with more money than me”, be it i come OR wealth. It’s a relative position and odten based more on feelings (often envy) than numbers. You see this kind of envy and outrage all over financial blogosphere. Being wealthy is one thing, but feeling wealthy is rather more to the point, and is a very personal measure. It has so much to do with how we compare ourselves to others (or not). John Bogle’s book ENOUGH is a good read on that subject. And yes, the confusion between wealth and income is irritating, as is the assumption that someone with a mansion and expensive autos is wealthy. Very often, what you see is all they’ve got. Thanks for the article. I’m annoyed at the conflation between income and net worth as well. It’s timely because our tax system is making it difficult for young people to build wealth. Even though I’m not one to tout raising taxes, it’s important to distinguish that just because someone is making $250k/year doesn’t mean they have any or are even able to much wealth. If you’re wealthy and good with managing your money, your taxable income can be didley squat but you can be making wealth in investments. This is what California doesn’t seem to get. Great article, JD. Since we’re on the topic of pet peeves, I’ll share mine that is relevant. Sing it sister. Er, brother. Well, there are a number of different kinds of wealth, just as there are many kinds of income. Worse, some forms of income could also be considered wealth, or vice versa. Income could be construed as being salary and wages, dividends, interest, collected rents, drawing from retirement accounts, pensions, and business income. Any of which might, or might not, be used to increase your wealth. Meanwhile, your wealth should be invested and, quite aside from the income derived from dividends, rents, interest, and business income, is increasing in value (and hopefully faster than the rate of inflation) it can still be increasing in value. In the sense that this can increase in your wealth, it could still be considered income, even though it might not be taxable until whatever increased in value is sold. If you own your own home outright, you might also consider what it would cost you to rent it as income in the sense that this sum is being earned by the funds you have invested in the property. Alternatively, a pension could be considered as wealth rather than income. For example, deciding that a risk-free investment right now returns 2.5%, you could then calculate the value of a 25k pension as being equivalent to 1 million dollars in wealth. Great article, I love the quote “Earning money is only part of the equation. What you do with the money you earn has a profound impact on your wealth.” It is truly not what you earn, but what you keep that makes the difference. I believe the ability to simply save money on a consistent basis, and avoid consumer debt, are the keys to building wealth for the average family. As they accumulate savings, most will begin to educate themselves about money, investments, etc. At a certain point, their passive income from investments will grow beyond their earned income. It’s SIMPLE, it’s just not EASY.